I've written about our efforts to become more minimalist in the past, so I also feel I should share when it's just not working out. Like now. OK. So, we were doing well several years ago, but I noticed the creeping of stuff started after Eloise was born. I think it was a mix of getting an influx of baby items and putting my guard down. It's an excuse, yes, but it's harder to stay on top of things with a baby/toddler around AND sometimes there's stress. And as much as I'd like to say it isn't true, I do still have stress-shopping tendencies. We're all works in progress, right? Anyway, as I sit in our basement playroom, I'm a bit disgusted. We have all these beautiful new and old toys strewn about. Many of them aren't getting good use. Instead of appreciating them, I'm incredibly annoyed at the moment. They're a giant source of stress for the adults and kids alike. Stress for me and Stephen because of constant pickup. Stress for the kids because there is so much, they're overwhelmed, hopping from thing to thing. I woke up wanting to throw everything in the garbage. So, before I do something crazy, I decided to write this post. Thing is, I don't even know where to begin. 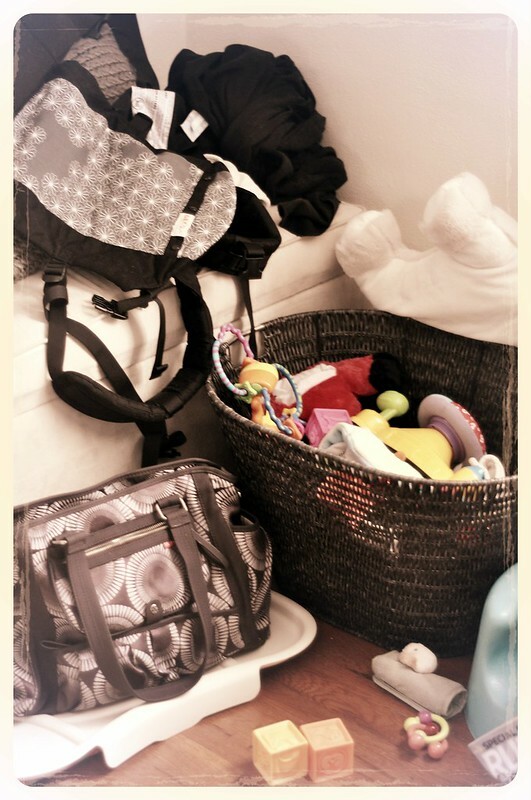 The main level of our home is relatively tidy most of the time. Not ever when I hop onto Instagram for some reason, so that's a fairly true representation of what annoys me. It's nothing a half hour of picking up can't fix, though. The second level where we sleep? Yikes. It was clean before Christmas. Laundry abounds from all corners now, along with some Christmas items that never found proper places to live. And, of course, the basement is an absolute wreck. Minimalism is about a lot more than just a clean house, and I think that's one area where we've strayed. Now, I also want to explain that I've always been more of a wannabe minimalist. We, as a family, are getting there. We're slowly arriving at a point where we're accepting the core principles of living with less excess and embracing those things with purpose. Anyone who's done it will tell you it takes time, and there will be back-sliding. All of this is to say that today I have written up a short to-do list that I'm hoping will help get us back on the right track. And, at least at first, this mostly means clearing some stuff out so I can think. So we can ALL think. Donate/get rid of one bag of my own clothing. Re-create a capsule wardrobe for winter. Have Stephen donate/get rid of a bag of his own clothing. Weed through Ada's and Eloise's clothing to store away anything that no longer fits them/is damaged/etc. or donate. Go through basement toys and pack away/donate at least one box of items that are no longer used or are damaged/missing pieces/etc. Reevaluate all toys and books in the living room. This is our most annoying area of clutter where Eloise's just grabs and throws things all over. We may temporarily eliminate toys in this space because it's getting to be too much at the present moment. Go through all mail and recycle/trash what isn't needed. Weed through kitchen drawers and donate/get rid of random cutlery, cups, appliances, etc. we're either not using or that's broken/missing pieces/etc. Identify a better storage area. We don't have many bins of storage, but keeping them in the garage isn't working out. Gather up a box of "maybe" miscellaneous things and put them away for a month or so to see if we actually need/want them to stay in our lives. I'm hoping these activities will only take an hour or so, and I'm also hoping I can update you on my progress next week.